Nutrient canals (NCs) are the radiolucencies representing the spaces in bone through which blood vessels and nerves travel to supply surrounding structures. They were first described by Hirschfield  in 1923, and are also called interdental canals, vascular channels, or interdental NCs. The terminal points of these canals are seen as small nutrient foramina. Some researchers have proposed that NCs are anatomic formations , whereas others are convinced that these canals are pathological formations . Their presence may explain difficulties in obtaining local anesthesia during dental surgical procedures and also the occurrence of focal bleeding during surgery. NCs were also reported to provide a pathway for the spread of infection . Moreover, the radiographic presence of NCs may be indicative of a knife-edged alveolar ridge and is, therefore, of particular significance in the assessment of potential implant sites . NCs are more commonly found in Afro-Caribbeans and more often in males than females . Intraoral periapical radiographs (IOPARs), despite being two-dimensional and limited in size, appears to be the best projection to identify the NCs. In IOPARs, NCs appears as linear radiolucencies and varies in size, number, and prominence and in their relationship to the roots of the teeth. Kishi et al. and Patni et al. , observed that NCs were more often seen in the mandible anterior region, followed by the maxillary premolar region in the wall of maxillary sinus. In the mandibular anterior region, Ennis  described their anatomy, stating that they are derived from the incisive branch of the inferior alveolar neurovascular bundle which supplies the anterior mandible. The predominance of NCs in the anterior mandibular region is attributed due to thin alveolar process, horizontally arranged trabeculae, decreased bony support of cortical and cancellous bone, and more prone to irritation from calculus and trauma,  Lovett  classified NCs into three types based upon their radiographic appearance. Type I: radiolucent line, varying in size as a fine thread-like marking to a width of 0.5 mm and in length from 1 to 2 cm. The course may be linear, circular, and haphazard or a combination of any two or all three. Type II: moderately radiolucent line, varying from 0.5 to 1.5 mm in width and 3 mm to 2.5 cm in length. Their course is linear or circular and only occasionally haphazard. Type III: broad, usually only slightly radiolucent line varying in size from 1.5 to 4 mm in width and 6 mm to 7 cm in length. Their course is mostly linear with smooth turns, or tight circular turns in the area of the mental foramen of the mandible. NCs have been correlated with various pathological conditions such as periodontal diseases, hypertension (HT), diabetes mellitus (DM), tuberculosis, rickets, calcium deficiency, disuse atrophy, and coarctation of the aorta and can be used as a diagnostic marker of various systemic diseases . HT being one such condition is also called a silent killer. It is the most commonly encountered medical condition in the dental office. There occurs the dilatation of arterioles, hypertrophy, and hyperplasia of the vessels wall and arteriosclerosis, along with thickening of the arterial wall. This leads to narrowing of the lumen which may lead to the opening of more collateral blood vessels to compensate for diminished blood supply. All these changes may contribute to increase the presence of NCs in hypertensive patients . The DM is the second most common medical condition seen after HT in the dental office. The insulin deficiency has mitogenic action on the endothelial cells which would lead to collateral vessel formation and leading to narrowing of blood vessel lumen. Hence, this collateral vessel formation may act as a compensatory mechanism which may lead to increase the prevalence of NCs in this condition ,. Since IOPARs help in recognizing subtle differences in the appearance, number, and location of NCs, the dentist can have a role in suspecting underlying systemic diseases such as HT as well as DM, and indicating the need for further investigations. With this background, the present study was conducted to evaluate and compare the NCs (presence, number, and location) in the mandibular anterior region among HT and DM patients using IOPARs. The present study comprised randomly selected patients (n = 600) equally divided into three groups such as Group I (n = 200): hypertensive patients; Group II (n = 200): DM Type II patients; and Group III (n = 200): healthy patients as controls, with an age group ranging from 21 to 60 years from daily outpatient department of Surendera Dental College and Hospital, Sri Ganganagar, Rajasthan. The present study was conducted in accordance with the Declaration of Helsinki and was approved by the Local Ethical Committee of the Institute (SDCRI/IEC/2015/002). Informed written consent was obtained from all patients before their enrollment in the study. The inclusion criteria consisted of (1) patients with positive medical history of HT or DM Type II for minimum 3 years. The exclusion criteria consisted of (1) patients with history of having both HT and DM, (2) other systemic diseases apart from HT and DM, (3) patients with severe bone loss or crowding of lower anterior teeth, (4) edentulous patients or patients with any missing teeth in lower anterior teeth region, (5) patients with periapical pathology in the mandibular anterior region radiographically, (6) pregnant women, and (7) poor quality IOPARs. The selected patients were clinically evaluated by making them seated comfortably on a dental chair. The diluted 0.2% chlorhexidine gluconate mouthwash was given to rinse the oral cavity. Individuals demographic data, general and medical history, and clinical examination were carried out in a systematic manner. The blood pressure (BP) was measured with stethoscope and sphygmomanometer using auscultatory method preceded by the palpatory method, followed by random blood sugar (RBS) level investigation for each selected patient. The patients having BP >120/80 mm of mercury were selected as hypertensive. If the values of the RBS were found above normal (<200 mg/dL), they were advised to come on empty stomach on the next day, and the patients were subjected for fasting blood sugar (FBS) evaluation. The patients having RBS ≥200 mg/dL or FBS ≥126 mg/dL were selected as diabetic patients. Then, dental examination was carried out for each patient. The relevant findings were entered in a designed performa. After the clinical examination and blood investigations, IOPARs of the mandibular anterior region was taken by using paralleling technique [Figure 1]; taking into consideration, the International council for radiation protection guidelines, protecting the patient and the operator. All the radiographs of three study groups were evaluated by two observers independently (two oral and maxillofacial radiologist) for the presence or absence of radiolucent lines running vertically either in interdental area or in the periapical region between the right lower canine to left lower canine (#33 to #43) and the total number of radiolucent lines and were recorded as NCs [Figure 2]. The observations were entered in the performa from which master charts were prepared for statistical analysis. Data, thus obtained were tabulated and subjected for further statistical analysis using SPSS 20.0 (Microsoft Corporation Inc., Chicago, IL, USA) statistical software. The two-tailed t-test was done and was considered statistically significant when P value < 0.05 while Cohen's kappa test was applied to analyze interobserver reliability. The Chi-squared test was performed for intergroup comparison. A comparative study consisting of randomly selected 200 hypertensive patients (mean age = 40.72 years), 200 DM patients (mean age 45.03 years), and 200 healthy individuals (mean age = 42.05 years) were undertaken to study the incidence of NCs in each group [Table 1]. According to observer 01, of 600 patients, 453 patients (75.5%) exhibit NCs while 147 patients (24.5%) did not have NCs whereas according to observer 02, 451 patients (75.1%) have NCs and 149 (24.8%) did not have [Table 2]. The Cohen's kappa test was performed to analyze interobserver reliability between two observers, since P = 0.000 (P < 0.005), kappa (k) coefficient was found statistically significant, indicating interobserver bias to be nil [Table 2]. Hence, for further statistical analysis, the observer 01 findings were considered. The incidence of presence of NCs was 1.9 times more in Group I when compared to controls while it was 2.1 times more in Group II compared to controls. Furthermore, on intergroup comparison, using Chi-square test statistically significant (P < 0.05) increase in NCs was found in Group I and II compared to controls while the difference was found statistically insignificant between Group I and Group II (P > 0.05). The total of 888 NCs were found in 600 patients, of which maximum NCs were found in Group I (65.5%) followed by Group II (59.3%) and Group III (23%) [Table 3]. On comparing the incidence of presence of NCs among both genders in Group I, II, and III no statistical significant correlation was found (P > 0.005) in any of the study group; although, more number of NCs were found in males among all the study groups. Regarding the distribution of NCs in various locations (between or beyond roots) seen on periapical radiographs, the interobserver reliability was good (P = 0.000) in all the study groups. The maximum NCs located between the root were noted in Group I patients (187), whereas Group II and Group III patients showed the equal number (190 each) of interradicular located NCs. On intergroup comparison for location of NCs, it was found that the incidence of NCs was found more between the roots among all the study groups; although, no statistically significant correlation was found regarding the location of NCs between different study groups (P > 0.005) [Table 4]. On comparing the incidence of presence of NCs with duration or severity of HT and DM in Group I, II, and III, no statistical significance correlation was found (P > 0.005) [Table 5]. Alteration of normal structure, either in bone or in soft tissue should be assessed when establishing a diagnosis. This study is also based on the same principle where evaluation of NCs on periapical intraoral radiographs of anterior part of the mandible was performed to indentify the incidence of these canals in normal situations and their alterations in cases of systemic diseases such as DM and HT. The NCs are well visualized on IOPARs, the standard radiographs in diagnosing, and evaluating diseases of teeth and jaws. If established facts are available about the NCs, it would be easy for any clinician to interpret the presence and the aspects of these tubes like canals because they might be considered a valid diagnostic marker for some specific systemic diseases . The patients with HT and DM were only considered for this particular research not only due to the easy availability of these cases in dental office but also as these diseases are one of the major risk factors for other systemic diseases such as heart attack, stroke, or renal failure and better control can lead to prevention of these life-threatening diseases. Thus, any new aspects evolved in this study would aid in early diagnosis, prevention, and control of DM and HT. In the present study, diabetes group patients when compared to controls showed a statistically significant increased presence and total number of NCs. This is in accordance with Pierrakou and Donta  Reddy et al. , Behl et al. , Yustiaputri et al. , Selarka et al. , and Castelino et al. studies. The reason attributed to this higher prevalence of NCs was that, the deficiency of insulin has mitogenic action on the endothelial cells which could lead to collateral vessel formation . Furthermore, the process of atherosclerosis can be seen leading to narrowing of blood vessel lumen. Hence, this collateral vessel formation may act as a compensatory mechanism which leads to increase the prevalence of NCs . Moreover, resorption of alveolar bone associated with DM and the reduced thickness of alveolar bone are other contributing factors for more pronounced appearance of NCs in mandibular anterior region on IOPARs. Furthermore, the NCs were present in 65.5% of hypertensive patients whereas only 58% of hypertensive patients showed NCs in a study conducted by Bilge et al. , 54.3% in Jaju et al. , 75% in Yilmaz et al. studies, 70.4%–78% of hypertensive patients depending edentulous or dentulous condition by Patni et al. studies. The reason for the variability in the prevalence of NCs among the present study and the previous studies could be attributed to the fact that in previous studies other factors such as periodontitis, dentulous/edentulous, and calcium deficiency were also included which were excluded from the study. The hypertensive patients also showed statistically significant increased presence and total number of NCs compared to healthy patients which was in agreement with Bilge et al. , Jaju et al. , and Yilmaz et al. previous studies. The reason for this may be attributed to the principal effects of HT that is dilatation of arterioles, hypertrophy, and hyperplasia of the arterial walls and atherosclerosis. In atherosclerosis, along with thickening of arterial walls, there is narrowing of the lumen which may lead to opening of more collateral to compensate the blood supply. Thus, either dilatation of the vessel wall or opening of more collateral or both of these changes may be responsible for the increased prevalence of NCs in these patients . On comparing the total number of NCs among Group I and II, more number of NCs per patient was observed among hypertensive patients (Group I) which was in agreement with Poornima et al. and Patni et al. studies. This occurs due to the calcification of the collateral blood vessels in the terminal stage of arteriosclerosis among patients of mean 10 years of HT while the mean duration of the hypertensive patients in present research was minimum 3 years leading to more number of NCs ,,. The incidence of the presence of NCs was noted more among diabetes group (Group II) compared to hypertensive group (Group I) due to dual effect of vascular dilatation and opening of new collaterals in these patients. The NCs were observed more in males (40.3%) in Group I and II as well as in Group III as compared to females (35.2%). The difference in the NCs among the three groups in males and females was statistically insignificant. The present study was consistent with the findings of Kishi et al. , Patel and Wuehrmann , Pierrakou and Donta , and Bilge et al. but was not consistent with the study done by Donta et al. who reported a prevalence of 60.8% in females and 39.2% in males. This could be attributed to more population of male patients in all the three groups of present study as sample was selected randomly. Furthermore, the mean age of the patients with NCs was more than those without NCs in both Group I and II but this difference was statistically insignificant. According to Sweet , as the age increases, the average number of NCs findings also increases, because it is known that nutrient channels and foramen exist in all individuals, whether or not they are disclosed in radiodontic examination, this is the first indication that, older the individual the more chances to discover NCs and the foramina due to age-related hormonal and osteoporotic changes. Considering the radiographic technique, Goodman Topper ED et al. , Reddy et al. , and Yustiaputri et al. studies had not mentioned the radiographic technique used in the study. Jaju et al. , Abdar-Esfahani and Mehdizade , Poornima et al. , and Kumar et al. researchers used bisecting angle technique, whereas Patel and Wuehrmann , Singh et al. , Selarka et al. , and Castelino et al. had employed paralleling technique. The paralleling technique with XCP had been used in this study also for taking the radiographs as it was considered to be an ideal IOPAR technique with fewer chances of errors, better reproducibility of results, and relatively easy to practice in lower anterior region. For location, a higher percentage of the prevalence of NCs between the roots has been observed in all the three study groups than that extending beyond the apex. These findings confirm well with the established anatomical/histological description of the bone in mandibular anterior region. The frequency of NCs was interrelated with the trabecular space size. The frequency of NCs for small, medium, and large spaces varied as 3:2:1 . Moreover, the trabecular pattern was horizontal in interradicular region of anterior mandible as compared to vertically dominating trabecular pattern of bone beyond the root apices. According to Patel and Wuehrmann , the number of NCs was substantially greater when the trabeculae were arranged horizontally; hence, supporting the present study results. The major shortcoming of the study was that for individual patient, no relation between the severity or duration of HT/DM and number of NCs was studied. The present study throws light on the increased incidence of NCs in these patients as compared to healthy patients. This suggests that increased number of NCs seen in IOPARs of mandibular anterior region can be an adjunct for the detection of HT and DM. It was also noted that NCs were more frequently present on interproximal areas than inferior to the roots. There was no significant correlation was found between severity of disease and incidence of presence of NCs. The increased number of NCs can provide diagnostic hint to the dentist to carry out further investigations for HT and DM. Furthermore, more studies with large sample size should be conducted in the future to substantiate the usefulness of radiographic presence and number of NCs as an additional aid in the detection of HT and DM. Hirshfeld I. A study of skulls in the American Museum of natural history in relation to periodontal disease. J Dent Res 1923;5:241-65. Stafine EC, editor. Anatomic landmarks. In: Oral roentgenographic diagnosis. 3rd ed. Philadelphia: WB Saunders Company; 1969, p. l-15. Goaz PW, White SC, editors. Normal radiographic anatomy. In: Oral radiology. 2nd ed. St. Louis: CV Mosby Company; 1987, p. 174-99. Carroll MJ, Hirschmann PN. The involvement of nutrient canals in periapical pathology. Dentomaxillofac Radiol 1980;9:18-20. Grondahl K, Ekestubbe A, Grondahl HG. Radiography in oral enddosseous prosthetics. Goteburg: Nobel Biocare; 1996. Patel JR, Wuehrmann AH. A radiographic study of nutrient canals. Oral Surg Oral Med Oral Pathol 1976;42:693-701. Patni VM, Merchant GJ, Dhooria HS. Incidence of nutrient canals in hypertensive patients: A radiographic study. Oral Surg Oral Med Oral Pathol 1985;59:206-11. Ennis LM. Roentgenographic variations of the maxillary sinus and nutrient canals of the maxilla and mandible. Int J Orthod Oral Surg 1937;23:173-93. Jaju PP, Suvarna PV, Parikh NJ. Incidence of mandibular nutrient canals in hypertensive patients: A radiographic study. Indian J Dent Res 2007;18:181-5. Lovett DW. Nutrient canals; a roentgenographic study. J Am Dent Assoc 1948;37:671-5. Pandarinat BG. A radiographic study of mandibular nutrient canals in patients with periodontal diseases. Int Arab J Dent 2015;4:24-31. Pierrakou ED, Donta CN. The nutrient canals. Radiographic alterations of the mandibular anterior region in diabetic patients. Odontostomatol Proodos 1990;44:331-7. Reddy VG, Ali IM, Shashikanth MC. An intraoral periapical radiographic study of nutrient canals as diagnostic aid in systemic diseases and pathological conditions. J Indian Acad Oral Med Oral Radiol 2008;20:49-53. Behl AB, Bali R, Ahmed J, Singh MP, Nahar P, Behl NS. Intra-oral periapical study of nutrient canals in relation to diabetes mellitus, hypertension and normal subjects. J Stomat Occup Med 2011;4:127-32. Yustiaputri F, Astuti ER, Noerjanto RP. Raiographic appearance of nutrient canals in diabetes mellitus patients. Dentomaxillofac Radiol Dent J 2012;3:2. Selarka B, Dudhia B, Chaudary AR, Tarsariya V, Ludhwani S, Sayed MA. 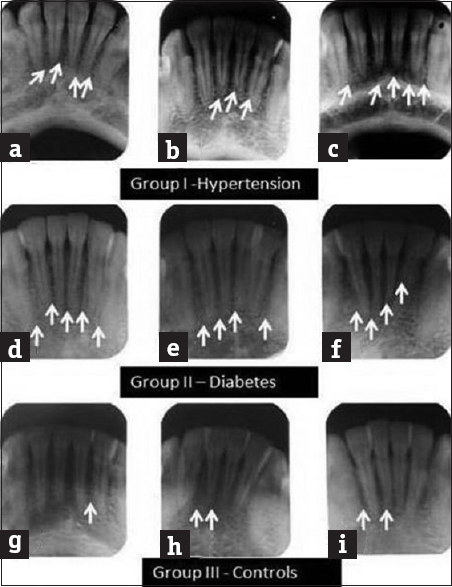 Evaluation of nutrient canals in periodontal disease, hypertensive and diabetes mellitus: A case control radiographic study. Int J Med Appl Sci 2014;3:261-8. 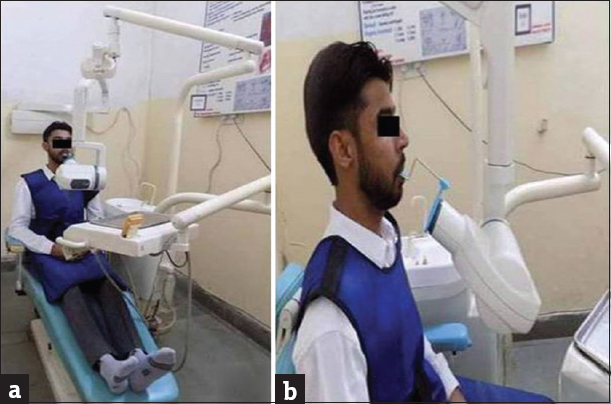 Castelino RL, Babu S, Shetty SR, Laxmana AR, Balan P, Ka F. Can intra oral periapical radiographs be used as an adjunct diagnostic marker in detecting underlying systemic diseases? A randomised case control study. Cukurova Med J 2015;40:661-9. Isselbacher KJ. Harrison's principles of internal medicine. 13th ed. New York: McGraw-Hill Inc.; 1994. Yilmaz AB, Akgül N, Akgül HM, Dagistanli S, Cakur B. Relationship between mandibular nutrient canals and hypertension. J Int Med Res 2003;31:123-5. Haslett C, Chilvers ER, Boon NA, Colledge NR. Davidson's principles and practice of medicine. 19th ed. London, UK: Churchill Livingstone Company; 2002, p. 388-92. Poornima B, Angadi A, Sakri SB. A comparative study of mandibular nutrient canals in healthy and hypertensive Subjects. J Sci Soc 2014;41:127-30. Donta CN, Pierrakou ED, Patsakas AJ. Incidence of nutrient canals in hypertensive patients with alveolar bone loss. A radiographic study. Hell Period Stomat Gnathopathoprosopike Cheir 1989;4:149-52. Sweet AP. A statistical analysis of the incidence of nutrient channels and formina in five hundred periodontal full mouth radiodontic examinations. Am J Orthodont Oral Surg 1942;28:427. Goodman-Topper ED, Chosack A. Radiographic appearance of nutrient canals in the region of the erupting permanent maxillary cuspid. Oral Surg Oral Med Oral Pathol 1989;67:606-10. Abdar-Esfahani M, Mehdizade M. Mandibular anterior nutrient canals in periapical radiography in relation to hypertension. Nephrourol Mon 2014;6:e15292. Kumar VR, Naik RM, Singh RT, Guruprasad Y. Incidence of nutrient canals in hypertensive patients: A radiographic study. J Nat Sci Biol Med 2014;5:164-9. Singh G, Rawson K, Kumar S, Srivastava A, Balakrishnan S, Sinha A. Evaluation of mandibular anterior nutrient canals in periodontal diseases: A prospective case control radiographic study. J Indian Acad Oral Med Oral Radiol 2011;23:5-8.